As a blogger, every now and again you come across products that you just don't get along with, no matter how much you want to love them. So, inspired by Jen's post, I thought I'd give a quick rundown of products that personally aren't for me, and why. The Seventeen Phwoarr Paint received rave reviews upon initial release, and as I was coming to the end of whatever concealer I was using at the time I thought I'd make a purchase. It was cheap enough. I did like it at first, it's definitely heavy duty as is mentioned on the packaging, but after a little while I noticed it was settling into fine lines (I feel a bit sick writing about fine lines at 21!) and was starting to look dry and cakey as the day went on. I ended up switching this for the Rimmel Wake Me Up Concealer which works so much better for me. Next up is another popular product, the Maybelline Baby Lips. I received this in the Latest in Beauty Glamour Box at Christmas and I was looking forward to give it a go, but I honestly can't understand the hype surrounding these. They have little to no moisturising abilities and once I went back to my EOS lip balm my dry, chapped and uncomfortable lips returned to normal. They may well be great for people with naturally soft lips, but it didn't do anything for me at all. 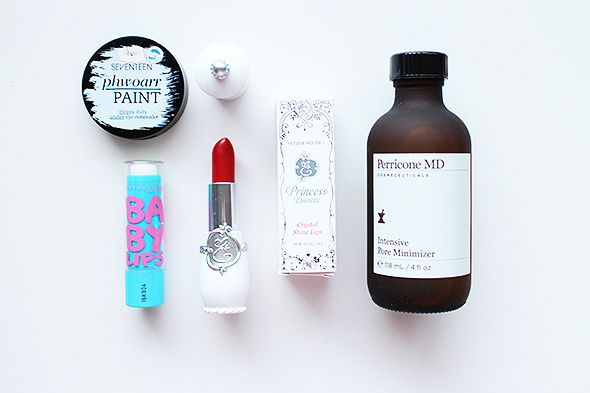 I really, really wanted to fall in love with the Etude House Princess Etoinette Lipstick in Precious Etoinette. I mean, how could you not adore the packaging? Unfortunately I floral scent was a little too overpowering and the gold sparkle that runs through the red felt a little too tacky for me. I'm not going to lie though, I'm holding on to it because it looks pretty. I was really excited when I was sent the Perricone MD Intensive Pore Minimiser. * As someone who slathers their nose in the Smashbox Photo Finish Primer almost daily to try to reduce their appearance, I thought this stuff would be a godsend. However although it felt refreshing to apply, once it dried onto the skin it felt tight and dehydrated, and I didn't notice any reduction in pore size. I'm actually starting to think this is what caused an awful breakout, and after reading into the ingredients a bit more I don't think I'll be using it again. The products mentioned above are not particularly bad products, as demonstrated by the rave reviews given by many. They just haven't worked for me or created more problems for me than they have done good. I strongly suggest reading reviews of products before you buy, particularly when it comes to skincare. Have you tried any of the above? Did they work better for you than they did for me? I completely agree with you on the Maybelline Babylips - doesn't do it for me at all. I hurried back to my EOS as well and they're just "the ones" for me. The baby lips is just a average lipbalm, i think it contains petroleum so thats why the moisture doesnt last. I'm not a big fan of the seventeen range, i would rather wear the rimmel concealer as well. Agree with you on the Baby Lips one, i think most people just agree that it's amazing even though in reality it's just a lip balm. EOS is medicated so it's much better! Those baby lips don't do anything for me either! It's a shame because the packaging is really cute. I wasn't a fan of the Seventeen concealer either way too cakey! I am not a fan of baby lips either & passed mine on to my younger cousin. They did nothing for my lips at all.